"The tendency for Christians to move almost immediately from death to proclamations of new life risks alienating those for whom healing and new life seem out of reach," says Thompson. 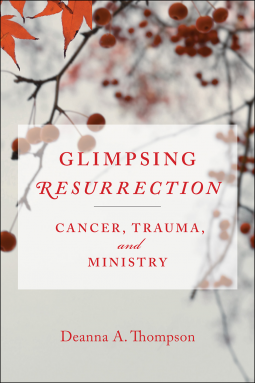 Glimpsing Resurrection focuses less on the "why" to help readers instead come to terms with the "how" of living with a serious disease. In particular, Thompson provides a framework and concrete suggestions for how to be a church where those who are undone by illness can be undone, as well as a place that can love and support them to hope. “Thompson breathes new life into the most familiar sites for Christian engagements with suffering—the Psalms, Job, crucifixion, Pauline resurrection—and insists that faith resides in the uncertainties, that Christ appears there, and that the church can hold space for grief and loss. Bringing life-threatening illness into the sphere of trauma, she rewrites the relationship between the cancer story and the Christian story."